Our best Ocarina of Time sage tournament continues with the first match-up of the Semi-Finals. 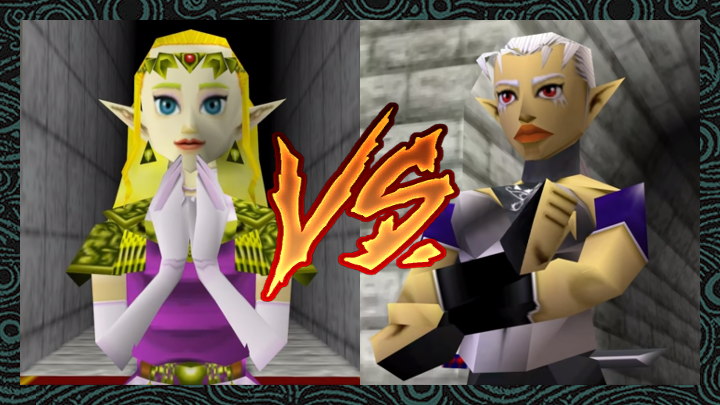 After all the craziness of Round 1, Zelda and Impa face off. Zelda, the princess of Hyrule, makes her long-awaited debut in the tournament. We meet young Zelda as a child in OoT, learning of her prophecy regarding the kingdom of Hyrule, the Sacred Realm, and Ganondorf’s threat. Her and Link quickly concoct a plot to nab the three Spiritual Stones and thwart Ganondorf’s plans. Things don’t go quite like they would have hoped, so Zelda goes into hiding for seven years and eventually returns in disguise as Sheik. As if learning that the Sheikah warrior who’s been helping you is actually the princess isn’t enough of a shock, we are also met with the revelation that Zelda is the seventh sage as well. Aiding the other awakened sages, Princess Zelda proves to be an essential asset to the last leg of Link’s quest. Impa earned a crushing victory over Princess Ruto in Round 1, raking in an impressive 250 votes. That’s the most of any competitor so far! While some were sure that Ruto was going to walk out of the bout unscathed, the Sheikah warrior proved the naysayers wrong and easily defeated her opponent. Several voters brought up Impa’s overall importance to the story of Ocarina of Time. She sets Link’s and Zelda’s plan into motion early on, protects and trains the princess while Link slumbers, and eventually hands the reigns over to the younger heroes when they are truly ready. Some would argue that her cunning and wise nature make her the ideal example of a sage. It’ll definitely be interesting to see how far she makes it in this tournament.